I’m excited to announce a new member of the family. After a five-month wait, my Hill Country Rifles custom rifle arrived on Thursday. Stainless steel left-hand Stiller Predator action (a high quality Remington 700 clone). 20″ stainless steel Hart #3 match barrel in .308 Winchester. McMillan Edge Technology stock with Pachmayr Decelerator recoil pad. Leica ER 2.5-10x42mm riflescope with AquaDura lens coating. Weight with scope: 7 pounds 9 ounces. Guaranteed 0.5″ three-shot groups with Federal Premium Vital-Shok 165 grain Sierra Game King ammo. 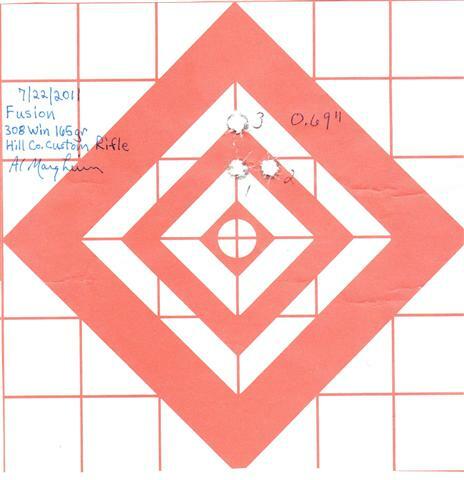 One of the great things about this rifle is its ability to shoot small groups. 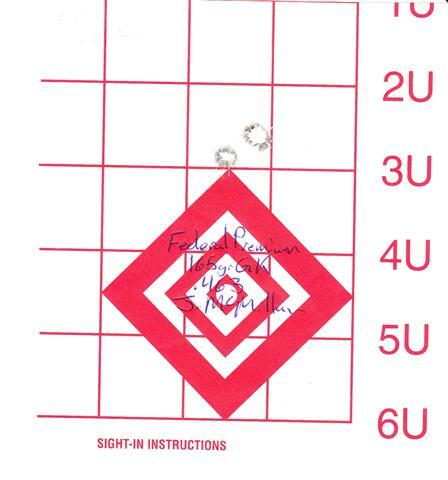 Below you can see signed test targets from Hill Country Rifles showing that the rifle will shoot 0.4″ groups with Federal Vital-Shok ammo loaded with Sierra Game Kings, and 0.17″ groups with Federal Gold Medal 168 grain Match King ammo! 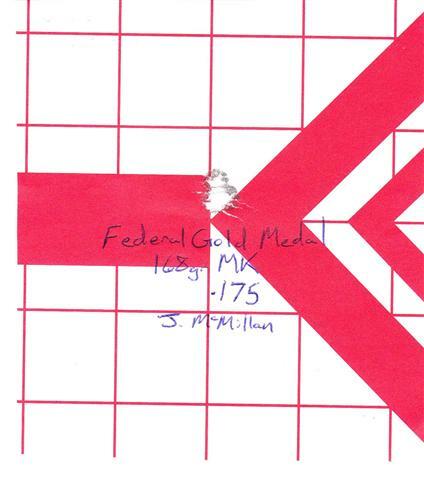 I’m waiting on some Federal Gold Medal and Vital-Shok ammo to arrive, but during my first range session with the rifle I shot a 0.7″ group with some Federal Fusion 165 grain ammo that was in my gun cabinet. 1.9″ – Winchester Supreme 168gr Ballistic Tip. This will be the first time I’ll be able to hunt with a left-hand rifle in many years. I can’t wait for deer and antelope season! Last October I hunted the early West River deer season in South Dakota and had a great time. The only thing that marred the experience was that on the last day of the hunt it rained heavily and my almost-new Irish Setter hunting boots with 600-gram Thinsulate and Gore-tex linings got soaked inside because I neglected to wear waterproof pants which allowed my long underwear and the insides of the boots to get very wet. When I got home I made the mistake of setting the boots aside and promptly forgot about them until mid-November when I got them out for another hunting trip. To my dismay the boots had an overpowering smell of mildew. I didn’t have time to deal with the mildew before I left on another hunting trip so I just put up with the smell until hunting season was over. After hunting season ended, I emailed W.L. Gore and asked them for recommendations on ways to get remove the mildew without damaging the gore-tex. Gore’s customer service department recommended soaking the boots in a solution of Lysol. I just couldn’t bring myself to do that so I spent a hour or so with Google, searching for other solutions. Google turned up several recommendations for a product called Mirazyme. I ordered two bottles and gave it a try. Mirazyme by itself didn’t eliminate all of the mildew odor, but it helped a great deal. What the Mirazyme didn’t get rid of was removed with Silver Scent Eliminator with Colloidal Silver. Here’s the process that I followed that eventually got rid of the smell of mildew. 1. I soaked the boots twice for 10 minutes in a Mirazyme solution consisting of about 1/2 oz of Mirazyme to 8 gallons of water. Each time I dried the boots over a heater vent. The first soaking rid the boots of about 50% of the mildew smell. The second soaking got rid of only a little more of the smell. 2. Next I followed the advice on the McNett web site for dealing with very stubborn odors. I soaked the boots twice for five minutes in a Mirazyme solution consisting of about 2 oz of Mirazyme to two gallons of water. Again, after each soaking I dried the boots over a heater vent. After the first soaking in the stronger solution the boots smelled much better. After the second soaking, most, but not all of the smell of mildew was gone. Unfortunately, there was just enough smell of mildew left to still bother me. 3. Finally, I sprayed the inside of the boots until they were wet to the touch with Primos Hunting Calls Silver Scent Eliminator with Colloidal Silver (Model No. 58001). Then I set the boots outside in the sun to dry. I’m pleased to report that the Silver Scent Eliminator removed the last vestige of the odor of mildew!